Sometimes it can be hard to stop thinking of our loss and how we might have done things differently, yet we know life does await us and holds many miracles even if we dont'see them right away. 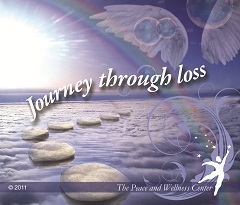 Journey Through Loss guided meditation is designed to help you in the steps along your journey through loss by focusing on the love you shared, on how your loved one is still with you in Spirit and how he or she would want you to live a good life. This guided meditation is designed to help the grieving heart. A good friend of mine, Chelsea Hanson who owns a sympathy gift store and has lost both of her parents, suggested I create a guided meditation to help people who are grieving. We had worked on other types of healing projects together before with good results, so I got started on it and Journey Through Loss guided meditation is the result. Grief can be a complicated emotion, this guided meditation cannot solve all the emotions and challenges with losing a loved one, but it does help to heal a grieving heart. The meditation focuses on the love that has been shared with our loved one, and how that love continues since we are always connected with our loved one in Spirit. When you listen to it you can think of one special person who has passed or all your loved ones. Karen Dutil, widow and bereaved Mom comments "The Journey Through Loss meditation helped me reconnect with my loved ones on a deep spiritual level, bringing gentle peace and healing to my once broken heart"
This guided meditation holds a special place in my heart because my Dad passed into Spirit when I was just 13. Since that time I was on a search to understand what we are really here for. Since researching and searching for 33 years for this answer, I have found both through reading and personal experience in meditation and more, that it is all about love. We are here to love, be loved and learn even more about love and then upon our physical death, we return home to share the love we have learned about. As much as we may miss our loved one who has gone ''home'' ahead of us, we are still connected in Spirit and will meet with them in Divine timing.